The United States is in the midst of a deadly opioid epidemic, with 72,000 people estimated to have died from drug overdoses in 2017 alone. The crisis was caused by the systemic overprescription of opioid pain relievers, fueled by a massive drug industry campaign to downplay the risks and straight-up lie about the dangers of their drugs. Troublingly, it has come to light that Tufts programs were used to promote the opioid industry’s lies. Purdue Pharma, wholly owned by the Sackler family, is one of the companies most responsible for the opioid epidemic. Purdue makes OxyContin, and for decades they systematically lied about its effects in order to sell more pills at higher doses. As tens of thousands of Americans died, the Sacklers made billions, some of which found its way to the Sackler School of Biomedical Sciences here at Tufts. Although the school was originally founded with donations from three Sackler brothers in 1980, before OxyContin was invented, the Sacklers have continued to give large sums of money to Tufts, including to establish the Masters in Pain Research, Education, and Policy program through the Medical and Public Health Schools in 1999, and the Raymond and Beverly Sackler Convergence Laboratory in 2013. As the role of the Sacklers in the opioid crisis has become increasingly clear through news reports and the activism of artist Nan Goldin, there has been some discussion about the appropriateness of the school’s name. Tufts’ biomedical scientists dedicate their careers to saving lives, after all, not destroying them for profit. But the conversation has remained relatively abstract, more about the symbolism of good deeds sponsored by bad people than about the concrete effects of the Sacklers’ money. That has to change now. The Sackler name is no longer an abstract morality problem, if it ever was, but a full-blown crisis of academic integrity. According to a lawsuit from the Massachusetts Attorney General’s office, Purdue Pharma used the Sacklers’ donations to systematically corrupt Tufts’ curriculum and research in favor of opioids. The Attorney General’s allegations are mind-boggling. Purdue employees placed unlabeled curriculum materials in Sackler School courses, and talked afterwards about “penetrating this account.” A seminar on opioids in Massachusetts was regularly taught by Purdue staff, and Tufts helped the company develop pro-opioid materials for patients. The head of the Masters in Pain Research program spoke in favor of Purdue at FDA meetings in 2012 and 2013. Purdue sent staff to Tufts “regularly,” as recently as 2017. The CEO of the company wrote to President Monaco in 2017 “to promote Purdue’s contentions about opioids and offer to meet,” though the lawsuit does not say President Monaco took him up on the offer. And all this happened after Purdue Pharma was fined $600 million in 2007 for misleading regulators, doctors, and patients about OxyContin’s potential for addiction and abuse. To be clear, Tufts is not the only institution alleged to have been improperly influenced by Sackler money. Following millions in donations, Massachusetts General Hospital even named its pain program after Purdue Pharma—then changed the name as the scale of the opioid crisis became apparent. Last week, Attorney General Maura Healey stated that Purdue Pharma and the Sackler family are “one and the same.” It is not possible to separate the Sackler name from the crimes of the company that made them billions. It is disturbing that the makers of OxyContin had such deep influence over research and education at Tufts. In addition, Purdue and the Sacklers’ close connection to a leading biomedical research institute allowed them to maintain credibility in the medical community for years after it was clear their product was killing people. It is too late to save the hundreds of thousands of Americans whose lives have been lost to the opioid epidemic. But Tufts can act now to undo some of the damage it has caused. First, Tufts needs to immediately change the name of the Sackler School. Faced with lawsuits and protests, the Sackler family and Purdue Pharma can still draw credibility from having their name attached to one of the country’s top biomedical schools. The recent resurgence of the tobacco industry shows that the makers of deadly drugs will seize on any remaining scraps of credibility to push their product. We cannot let that happen. 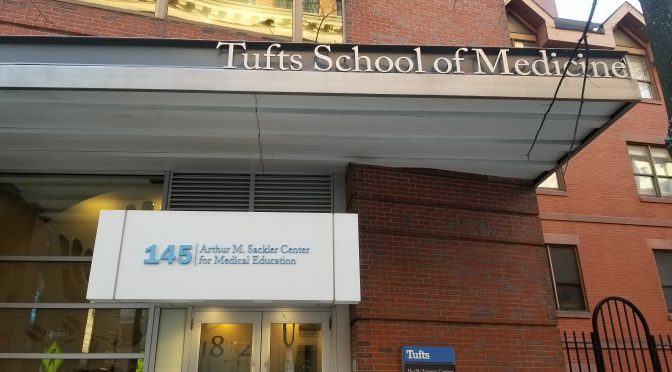 Second, Tufts must establish a commission of medical professionals, students, and members of the addiction advocacy community to thoroughly review all improper connections to Purdue and the Sacklers, past and present, including but not limited to those alleged in the Attorney General’s lawsuit. The results of the review should be made public. Given the extent to which Tufts’ academic integrity is alleged to have been compromised, a fully transparent review process including students and addiction advocates is the only way to genuinely move forward. As an added benefit, the students involved will get an excellent education in the sociopolitical determinants of health. Third, Tufts must file an amicus brief in support of the Massachusetts Attorney General’s lawsuit against Purdue Pharma and members of the Sackler family. Finally, Tufts must implement clear guidelines to prevent any donor from compromising its academic integrity in the future. Editors’ Note: The views of the author do not necessarily represent the views of the Sackler Insight editorial board or that of the Sackler community. Below is an official response from Patrick Collins, Executive Director of Public Relations at Tufts. Tufts University has always been and remains deeply committed to the highest ethical and scientific standards in research and education. The information raised in the Attorney General’s lawsuit against Purdue Pharmaceuticals and other defendants is deeply troubling. We will be undertaking a review of Tufts’ connection with Purdue to ensure that we were provided accurate information, that we followed our conflict of interest guidelines and that we adhered to our principles of academic and research integrity. Based on this review, we will determine if any changes need to be made moving forward.